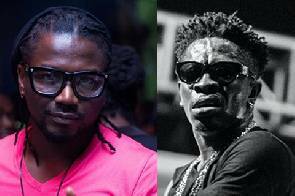 The Musicians Union of Ghana (MUSIGA) has initiated a series of steps starting Monday, November 25 to resolve a growing feud between dancehall artistes Samini and Shatta Wale. A committee set for this purpose is led by ace music producer, Edward Nana Poku Osei (Hammer), National Director of Hiplife backed by Hiplife Grandpapa Reggie Rockstone. Reports say the committee will hold a closed door meeting with Shatta Wale and Samini on Monday, November 25 at Rockstone’s Office. The two artistes have for some time now, been engaged in heated exchanges and attacks through their music. Many musicians and well meaning fans, disgusted by the development have called a truce. But the situation has continued, prompting MUSIGA, to take the steps. Hammer explained in a statement that, the objective of the talks is to find common ground to inspire a truce that will eventually stop all existing feuds in the music scene. The committee has Daddy Bosco (Administrator at MUSIGA), Black Prophet, Panji Anoff, Kwame Sefa Kayi, Reggie Rockstone and Rita Marley, widow of Bob Marley, the greatest reggae artiste of all time. The second meeting will involve both High Grade Family (Samini) and the Shatta Movement (Shatta Wale) and will explore mutual understanding between the two. The third sitting, in the form of Media Briefing, “will have the two giants, possibly, shake hands and hug to send the best signal to their fans as well as the streets to calm their nerves,” Hammer said. In the meantime, the committee has decided that neither of the two parties will grant interviews about progress of the meetings, until a resolution is reached. In a related development, the President of MUSIGA, Bice Osei Kuffour has urged fans of both Shatta Wale and Samini to remain calm ahead of the November 23 Guinness Big Eruption Concert at the Accra Sports Stadium on Saturday, November 12. “As responsible musicians, we shall not allow people to take advantage of this situation. What we know how to do best is to entertain our fans,” he said. “Both Samini and Shatta Wale have personally assured me they will keep doing what they do best on stage and nothing else,” Obour added. This entry was posted in Uncategorized and tagged feud, Samini, Shatta Wale.